In an effort to represent the diverse communities across Arkansas and address each community's needs, the Arkansans for the Arts Board of Directors should strategically include two members from each region. 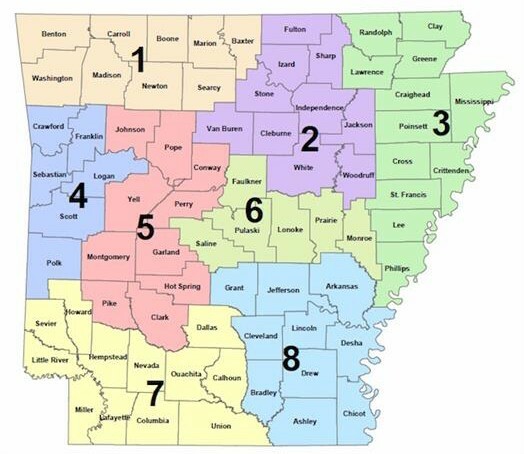 Regional designation is in alignment with the Arkansas Arts Council regional map. Garbo Watson Hearne is the director of Pyramid Art, Books & Custom Framing/Hearne Fine Art. Since 1988, her business has focused on African American culture through fine art and literature. Hearne is on the board of directors of the Mid-America Arts Alliance, National Assembly of State Arts Agencies and Arkansans for the Arts. She is a member of Alpha Kappa Alpha, Sorority, Inc., Beta Pi Omega Chapter and she is a member of the FBI Little Rock Citizen’s Academy. Hearne is married to Dr. Archie Hearne III and they have four children. Her hobbies include reading, collecting art, juicing and traveling. Craig Welle earned his BME from Morningside College in Sioux City, Iowa, an MA in Music Education from the University of Iowa, and Mid-Management Educator Certification through the University of St. Thomas in Houston. He became Music/Fine Arts Coordinator for the Spring Branch school district in Houston in 1990, a position he held for fifteen years. As president of the Texas Music Educators Conference from 2002-2004, Welle led the effort to establish the biennial MENC Southwestern Division Symposium for Music Education in Urban and Rural Schools and served as Conference Chair in 2003, 2005, and 2007. He accepted an invitation to serve two three-year terms on the College Board's Arts Academic Advisory Committee from 2010-16. In 2005, Craig took the position of Director of Fine Arts in Dallas Independent School District and in 2007 was named Executive Director for Enrichment Curriculum and Instruction, supervising the district-wide fine arts, physical education, library media services, instructional technology, JROTC, languages other than English and out of school time enrichment programs in the District. Welle retired from Dallas ISD in 2012 and has been named Executive Director of Arkansas Learning Through the Arts, a nonprofit organization that has been formed to connect arts learning to Arkansas Framework Standards for multiple school districts in Arkansas. In this position he continues to work with teachers to strengthen standards-based arts learning that prepares students for success in college and careers. Craig joined Arkansans for the Arts during its first year, and has served as Treasurer since then. Kate Schaffer is an Arkansas native who has used her public relations background in support of a wide range of non-profit organizations since 2003. Kate grew up in Central Illinois. She graduated from Baylor University in 1989 with dual B.A. degrees in Russian Studies and History. Upon graduation Kate lived in Dallas, Texas and worked for Maxus Energy in Investor Relations before joining Children’s Medical Center of Dallas as a Community Organizer. In 1995 she moved to Washington DC to join the National SAFE KIDS Campaign as District of Columbia SAFE KIDS Coalition Director, a position she served in until 2003. Kate and her family returned to Arkansas in 2003 to be near her family in Hot Springs. Since her return to the Natural State, Kate has “retired” from the working world, and began a new volunteering career supporting various non-profits. From 2003 to 2017 Kate worked for a broad array of non-profit organizations in Hot Springs including Circle of Friends for Arkansas Children’s Hospital, the Ouachita Children’s Center, the Hot Springs Area Cultural Alliance, First United Methodist Church, and the Hot Springs Documentary Film Festival. Upon moving to Bentonville, Arkansas in 2017 Kate became a volunteer at Crystal Bridges Museum of American Art, the Arkansas Children’s Hospital Foundation Board and several political campaigns. Kate and her husband Greg have two children; 16 year old Jenna is a junior at Bentonville High School, and 20 year old Isaac is a sophomore at Temple University in Philadelphia, PA. Kate, Greg and Jenna live in Bentonville with their three dogs, Cossette (Cozy for short), Dot and Dash, and their cat, Scratch. Dillon Hupp is a native of Little Rock, Arkansas, where he graduated from Little Rock Central High School in 2008. He attended Middlebury College in Middlebury, Vermont, where he graduated with a degree in American Studies and a focus in Race and Ethnicity in 2012. Following his graduation from Middlebury, he worked as a sportswriter in Vermont before moving back to Little Rock in 2013 to accept a position with the Democratic Party of Arkansas. A lifelong lover of the arts in Central Arkansas, Dillon was hired as Executive Director of ACANSA in April 2017. From 2013-2017, Dillon served as the assistant to the Chair, Finance Director, and Executive Director of the Democratic Party of Arkansas. During his tenure he oversaw some of the greatest fundraising success in Party history, including Jefferson-Jackson Dinners with Secretary Hillary Clinton in 2015 and President Bill Clinton in 2016. He also helped coordinate and execute a successful Arkansas delegation experience at the 2016 Democratic National Convention in Philadelphia. In his spare time, Dillon serves as the Treasurer of the Democratic Party of Pulaski County and the Commissioner of Little Rock RBI baseball, a program aimed at providing baseball instruction in a fun and safe environment for players who might not otherwise have an opportunity to play. Dillon lives in downtown Little Rock and enjoys watching sports, playing guitar, and struggling to maintain dominance over his three cats. Dr. Lenore Shoults grew up in New Jersey and earned a Bachelor’s degree in art and K-12 art education from Rutgers College. Her first career, as a theatrical costumer, led to travel throughout the United States and Caribbean and a move to Arkansas. Small business ownership followed which honed marketing skills and led to an interest in the Arts as an economic driver and the role of authenticity in tourism development. Shoults sold the businesses and went on to earn a Masters of Mass Communications and a Ph.D. in Heritage Studies from Arkansas State University. She has participated in the reaccreditation of two American Alliance of Museum institutions—the gold standard in the field. Working in the visual arts, theater, museums, tourism, and owning small businesses cemented the belief that the Arts are an economic driver and foundational element for building quality-of-place. Jean is a native of Hot Springs, recently retired five years ago from PepsiCo, Inc. in Dallas, Texas, as the Group Manager of Supplier Diversity promoting the inclusion and growth of minority and women owned business throughout the companies supply chain. In this roles, she was responsible for over $700 million in the purchasing of goods and services with diverse businesses with Frito-Lay, Tropicana, Pepsi Cola, Quaker Oats and Gatorade. She previously held various managerial positions with Pfizer, Inc.; Conoco Inc.; New York City Transit Authority and Temple University. She received a B.S. in Business Administration with minor in Accounting from Tennessee State University. As President, she is responsible for connecting residents, property owners and businesses together to address the needs, issues and problems of the Gateway Community, a historical neighborhood. She has led the acquisition of approximately $500,000 in CDBG funding for infrastructure projects in the neighborhood for 2014- 2018. In addition, she assist the association in developing partnerships with Habitat for Humanity, Walgreens Drug and Pharmacy, Walton Family Foundation, Simmons Bank, First United Methodist Church and many other businesses and civic organizations. She is a committed to the Hot Springs community through her involvement in the following: President, Gateway Community Association, Member & Chairperson,, Board Member of Hot Springs Documentary Film Festival, Board Member of University of Arkansas, Sam Walton College Diversity Board, Board Member, Philander Smith College Business Advisory Board, Board Member, Emergent Arts, Board Member, ARVEST Bank Hot Springs, AR, Board Member & 2nd Vice President, United Way of the Ouachita’s, Board Member, Quapaw House Board and Adviser and Advocacy Day Chair for Arkansans for the Arts. Throughout her career, she has had opportunity to establishing a strong network of contacts within the business community and she continues to dedicate these talents in contributing to building of a healthy and vibrant Hot Springs and Arkansas. Since returning to Hot Springs in 2010, Erin Holliday has led a multifaceted professional life balancing business, artistic, and community objectives. In 2012, she took the role of Executive Director of Emergent Arts and led the organization through relocation and rebranding. Emergent Arts now serves emerging artists of all ages and abilities in the areas of performing, visual, and literary arts education year round as well as hosting community art exhibits and events. Erin currently serves as a Planning Commissioner in Hot Springs and has recently completed training at the Community Development Institute at the University of Central Arkansas and she is in pursuit of a Professional Community and Economic Developer certification. Erin Holliday is a native of Hot Springs where she has been an active participant in the arts since her teens, volunteering for arts organizations and frequenting gallery exhibits and poetry readings. Erin relocated to Kansas City, MO where she received a BFA in sculpture from the Kansas City Art Institute. Professionally, Erin has worked in many different capacities within the arts community including professional curatorial art handling and installation, commercial and community gallery management, art consulting, and historic restoration. In both Kansas City and throughout Arkansas, she has been responsible for curating over 100 gallery exhibits, primarily composed of local community artists. Erin had the honor of being the first exchange artist of the Hot Springs - Hanamaki Sister City program and spent five weeks in Japan during the summer of 2018. She was then commissioned to create a site specific artwork to commemorate the 25th Anniversary of this sister city relationship. This installation is on display in Hanamaki, Japan; other public works can be seen at St. Luke's Women's Center in K.C. and the Olathe, Kansas Community Center. Ed Clifford is the President/CEO of the Jones Trust in Springdale AR, the Past President/CEO of the Bentonville Greater Area Chamber of Commerce, and occupied several merchandise management positions at Walmart Stores Inc. He is a Past Chair of the Arkansas Arts Council, and the Past Chair and current Board member of the Mid-America Arts Alliance. Antzee Magruder is a professional fabric artist who lives in West Memphis. She served as Chairman of the Arkansas Arts Council Board from 2016-2018. Representing Arkansas she served from 2016-2018 on the Mid America Arts Alliance Board of Trust. Since 2013 when she was appointed has served as chair of grant panels for General Operating support, Collaborative Project Support and Governors’ Arts Awards. During 2016 she served on the Development committee for National Association of State Arts agencies. In addition, her skills as a professional fabric artist were used as a contract costume designer for the Opera Memphis. Antzee also served as Opera Memphis Board Chairman 2013-14 and is a past chair of Crittenden Arts Council (DeltaARTs) in her hometown of West Memphis and where she continues to support and volunteer for the past 27 years. She represents her district along the Mississippi River to the AAC and makes the Arts a priority in her life. Dorothy Morris, President and CEO of the Morris Foundation, was born in Hot Springs County and had lived in Dallas Texas, for many years before returning to Arkansas in 1985. She resides in Hot Springs and continues the work of her late husband, Walter Morris, a pioneering philanthropist who helped create Heifer Project International. Through the Morris Foundation, Dorothy supports more than 50 nonprofits annually and provides seed money to many organizations. From food banks to the Fine Arts and medical research, the Morris Foundation has nourished Arkansas’s cultural institutions, both large and small, for decades. As a co-founder of the Hot Springs Giving Circle with Don Munro, Dorothy works with a group of dedicated philanthropists to create a model of “targeted giving,” having disbursed more than $600,000 since the inception of the Giving Circle in 2007. An enthusiastic collaborator, Dorothy worked to raise funds for Hot Springs artist Linda Williams Palmer which resulted in a touring exhibit of the “Champion Trees” project and an AETN Emmy Award-winning documentary film of the same name. He is currently licensed to practice in Arkansas and Tennessee, and is a member of the Craighead County and Memphis Bar Associations. Scott is married to Amy Cook Willhite and they have two daughters, Payton, age 16 and Channing, age 13. He is a member of Central Baptist Church and is active in the music ministry. He is a member of the Board of Directors of Be Free Revolution, a non-profit entity providing educational and spiritual guidance for children in Kenya and Uganda, a member of the Board of KLEK Radio Station, a non-profit entity providing education and entertainment to the local community, as well as the Chair of the Craighead County Republican Committee. Victoria Mays is pursuing a MFA in Creative Writing at the University of Central Arkansas. She has worked as a genre editor for Arkana literary magazine and interned for Et Alia Press. Note that they differ from legislative districts. Arkansans for the Arts is built on this statewide model of representation. Should you wish to nominate an Arts advocate leader in your community to be considered for Arkansans for the Arts Board of Directors position, please contact us.